This Frequently Asked Questions section is based on the questions that Adele gets...well, asked frequently. Feel free to ask your own questions in the comments section below. What is the Artisan-Sorcerer Series about? A group of artists and crafts-workers share a house near Sefton Park in Liverpool, and together they create paintings, pottery, masks and other beautiful works of art. Most of them hold down conventional jobs too, which is usual for many creative people these-days. A lot of the challenges they face reflect of the realities of modern life for ordinary people. However, they are also members of a secretive international magical order, and come into conflict with River Dee selkies and the notorious Caldy fae. Do you need to be into philosophy or New Age subjects to enjoy the series? Not at all - this is Fantasy fiction. If some people enjoy picking out the thread of philosophy, that's great; but many readers enjoy the adventure of believable characters facing difficult situations. There's plenty of magic, mystery and romance mixed in there, too, to satisfy Fantasy readers. Do the books have to be read in a particular sequence? If you wish to read the Artisan-Sorcerer series in chronological order, start with Bethany Rose, then Tamsin and then Rowan and then Fabian - though that's not the order in which they were published. There are some published short stories featuring the Caldy fae and Dee selkies, such as Spanish Jones and A Wirral Otherkin Trilogy. These loosely link to the series, as both the fae and selkies have roles in the stories; and these short ebooks can be read in any sequence. There are also some traditionally published short stories which link to the novels. Seagull Inn, (pbs. Hadley Rille Books in their anthology, Ruins Terra), introduces Rowan and Lydia in a ghost story set on Hilbre Island. The Club, (pbs. by Dark Moon Press in Dark of the Night: An Anthology of Shadows), introduces Jason and offers a glimpse into his life not long before he met Rowan. The Caldy fae feature in Old World Magic, (pbs. Hadley Rille Books in their Ruins Metropolis anthology). Fabian was published on the 9th September, 2016. There's a lot more magic in this book, for all that Fabian is forced to deal with real-world situations such as vandalism and harassment. Readers will also learn much more about everyday domestic life in the Artisan-Sorcerer's household. The sub-theme of Morgan's and Bethany Rose's decades-long romance continues, and will be viewed in a new light - but I'm not going to give away too many hints. The fifth and final novel in the Artisan-Sorcerer series is The Artisan-Sorcerer, which I'm currently writing. You also write short stories? I've been writing short stories for years. I enjoy the format. It's something that can be completed in a relatively short span of time - a few stolen hours or a weekend. So I decided to bundle some of these together into small ebook collections. I did something similar for my poetry. There are also two anthologies which I edited, City Stories and Seaside Stories, which feature contributions from a number of other writers plus my own work, and which are available as free ebooks. Yes; currently my only experiment into childrens books. It's about a young grumpet named Chip. You don't know what grumpets are? They're small, shy creatures who mostly live in compost heaps and do their utmost to avoid adventure. Chip, however, has other ideas. Read a lot, write a lot, edit mercilessly and persevere. Write the story that you'd like to read; write to satisfy your own aesthetics. Ignore fashions in literature. Experiment. If you discover that you don't enjoy writing, then try some other creative outlet. This is not a failure, merely a pause on your own creative journey. How do you feel about fanfiction and fanart? I really enjoy seeing fanart based on my books. I simply don't have time to read fanfiction. Please don't send it to me as I'll only delete it unread. However, if people wish to post fanfic or fanart online that is 100% fine with me as long as it's non-profit making and I'm acknowledged as the creator of the original ideas. Tell me about your paintings. I'm a member of a life drawing group, which I joined towards the end of 2017, and which is a lot of fun. 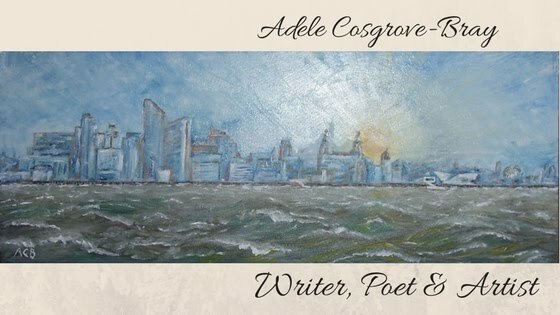 I began painting in oils when at art school, back in the very late 1980s, but for a long time after that period I hardly painted anything at all, being totally wrapped up in creative writing. After moving to Oxton, Wirral in 2015 I suddenly had much more space - and there was this back room which had excellent light for art so I turned it into a little art studio thinking my husband might use it, only he hardly ever has. Instead, it's become one of my favourite rooms, and I spend a lot of time in there. My enthusiasm and fascination for art has blossomed, and painting has become a major part of my life again. It has been like starting all over again, partially as I've also been learning how to paint in watercolour which demands a completely different technique from oils. Painting is as important to me as writing. What do you do when you're not writing or painting? My dogs give me the perfect excuse to go for long walks in the park, woods or along the beach, and I usually do a bit of sketching en route - I can't resist, and so nearly always carry a sketch book with me. I also do a bit of photography, potter around my garden, enjoy Italian and French cuisine, read almost non-stop and love browsing around antiques shops and flea markets.